The Camboriú Water Fund demonstrates an innovative, utility-driven approach to securing water. ​Balneário Camboriú in Santa Catarina state is a famous beach destination in southeastern Brazil that attracts increasing numbers of both domestic and international visitors. As a result of the booming tourism and civil construction sectors that now dominate the local economy, the combined population of Balneário Camboriú and neighboring Camboriú city, approximately 200,000 year-round, now swells to more than 800,000 during the summer high season (December through early March). Both municipalities count on the Camboriú River as a reliable low-cost source of drinking water supply. However, the increasing demand, especially during the summer tourist high season, severely stresses this supply. This is due primarily to a lack of any large-scale water storage infrastructure in the watershed, such as reservoirs that could buffer the impact of extended low streamflow events. The topography of the watershed, with its broad alluvial plain and relatively small surrounding sloped areas, is not naturally well-suited to reservoirs. However, high sediment loads at the water plant’s intake point also are limiting supply as they lead to large water losses in the treatment of stream water for municipal water supply. 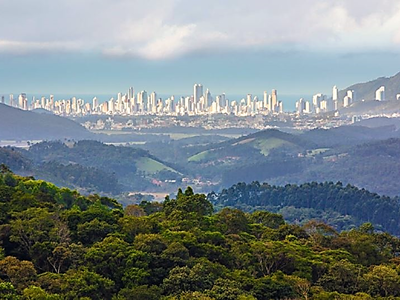 To avoid future supply shortfalls, the Balneário Camboriú Water Company, EMASA (which supplies both municipalities), evaluated options for securing sufficient future water supply. This option would aim to transfer water from a neighboring watershed characterized by substantially lower water quality that would necessitate advanced treatment. 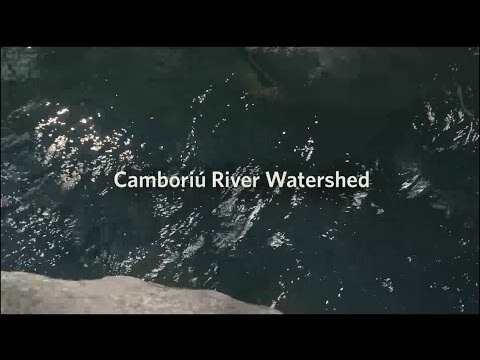 This option would aim to conserve and restore natural lands in the Camboriú watershed to maintain the high-quality water supply historically provided by the Camboriú River. Learn more about the exciting water conservation strategy being led by EMASA. EMASA elected to first invest in protecting natural forests and restoring degraded areas. Because of the high projected costs of the first two options and the promising results of initial feasibility assessments of the third, EMASA decided to first invest in protecting remaining natural forests and restoring degraded areas with high sediment loading to reduce treatment water losses and costs. Should this prove insufficient to achieve a reliable water supply, investments in the other two grey infrastructure options will need to be considered. To implement the watershed conservation strategy, in 2013 EMASA created the Camboriú Payments for Watershed Service (PWS) project in partnership with The Nature Conservancy, the municipalities of Balneário Camboriú and Camboriú, the Camboriú Watershed Committee, the State Sanitation Regulatory Agency (Agesan), the National Water Agency (ANA), Santa Catarina State’s Environmental Information and Hydrometeorology Center (EPAGRI-CIRAM) and the Camboriú city council. This new study models land change in the watershed with and without the PWS program and provides a template for how to assess the business case of other similar programs. Learn more about the Camboriú study by downloading the full document (you can also download it in Spanish or in Portuguese).